Today in my studio... listening to ethereal music by Ludovico Einaudi while a candle flickers softly in the distance, and the sweet fragrance of Nag Champa Flower incense fills my studio as my hands steadily prepare prints of my original artwork for our Art & Gift show. I became more aware how profoundly connected I am to my art. Each piece tells a story, it would seem to be my story since I created the art yet at the same time it is everyone's story. I became teary eyed with that realization and a calm, peaceful feeling enveloped me. It was as if I now know on a deeper level what I have always thought. Me doing art is much, much more than brush strokes or pencil markings. My art is about the story. We are all alike, we all feel the same feelings, from time to time, just in a little different way. My stories aren't unique. I am simply expressing them thru my art. This explains why people resonate with my art. As I look back I can see that my soul was whispering this to me thru my experience at Fort Vallonia Days a couple weeks ago. So...today in my studio... while I listened to ethereal music by Ludovico Einaudi while a candle flickered softly in the distance, and the sweet fragrance of Champa Flower incense filled my studio... I got it, I truly got it. Following comes the inspiration from today's nudges. Tell the story behind each and every piece of art. Each story is important to share. Perhaps you will identify with the story plus you will learn more about the artist behind the art... called ME! This is Tell My Story #1. This was my very first painting. It was me beginning to work thru the notion that I am "good enough, just as I am". As a child I never felt that I fit in. I always seemed to be an outcast. That scenario continued into my adolescent years followed by my young adult life. It would be fair to say that I have spent a good portion of my life not believing I was good enough. When I answered the calling in 2011 to follow my creative path it stirred many uneasy feelings. Once again I was in turmoil over the repetitive question. Am I good enough? Would I ever be good enough to make it in the art world? The pivotal difference between then and now is I know that we all face fears often in our lives, that we all feel unworthy from time to time, that we all are sad, lonely, and afraid. For sure, you will get knocked down often, just get back up. 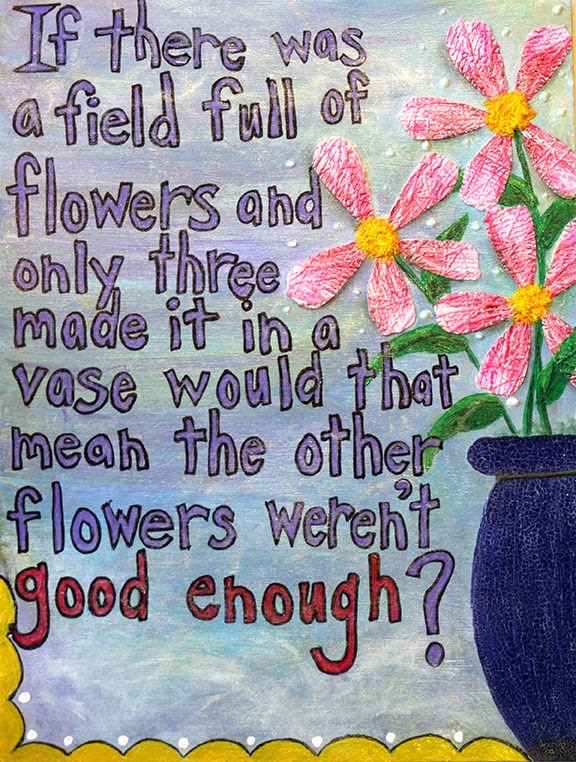 The answer to the question is - if you don't fit into one vase (metaphorically speaking) that's OK. It doesn't mean you aren't good enough. Bloom where you are planted and improve upon it to the best of your ability. YOU ARE GOOD ENOUGH - JUST AS YOU ARE!